You've probably heard of cat yoga, bunny yoga, goat yoga and even essential oils (that's your cue for a collective awwww). 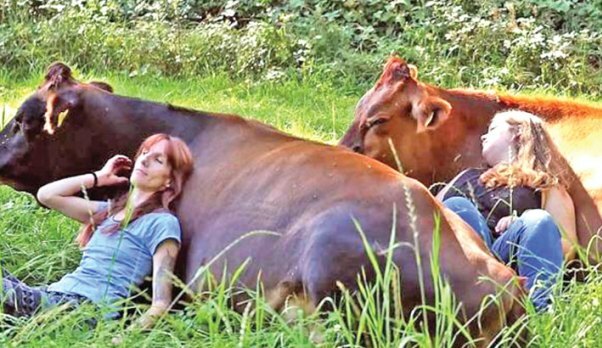 But what about the latest wellness fad: cow cuddling? Yep, offered at one Mountain Horse Farm in upstate New York, the "Horse & Cow Experience" gives farm-animal lovers a unique opportunity that "can bring relaxation, healing, awareness about your body language, comfort, mindfulness, build assertiveness, help with overcoming fear, build confidence, lets you be playful and teaches you to set boundaries." Believe it or not, people are now shelling out $300 for two people to spend 90 minutes cuddling, brushing and playing with cows. The wellness trend is simply called cow cuddling, and it’s the most recent addition to animal-centric holistic health offers, like goat yoga. If you’re reeling from sticker shock it might be because you’re from the Midwest and used to petting cows on nearby farms as they hang their heads over the fence — for free. During the 90-minute session you can pet the cows, brush them, play with them and, of course, cuddle with them, and sessions are facilitated by an equine specialist and a licensed cow counselor. We look for a whole new cultural language to arise, such as bovine benevolence, heifer hugging and livestock love. So pay your $300 and cuddle ‘til the cows come home. “For although they knew God, they neither glorified him as God nor gave thanks to him, but their thinking became futile and their foolish hearts were darkened. Although they claimed to be wise, they became fools and exchanged the glory of the immortal God for images made to look like a mortal human being and birds and animals and reptiles” (Romans 1:21—23).